Welcome to Serra Meadows. This Spanish style home offers three bedrooms all on the upper level with an open floorplan downstair for easy living in over 1800 sq.ft. An abundance of natural lighting greets you as you walk in the front door. Beautiful laminate flooring, granite countertops and stainless appliances add to the quality of the home. Upstairs master suite boasts light and ample space for relaxing along with a spacious master bath featuring dual sink vanity, walk in closet and large glass enclosed shower. Two additional guest bedrooms and guest bath are also spacious and light. Artistically designed landscaping with stone patio is great for entertaining and enjoying the views and afternoon sunshine. 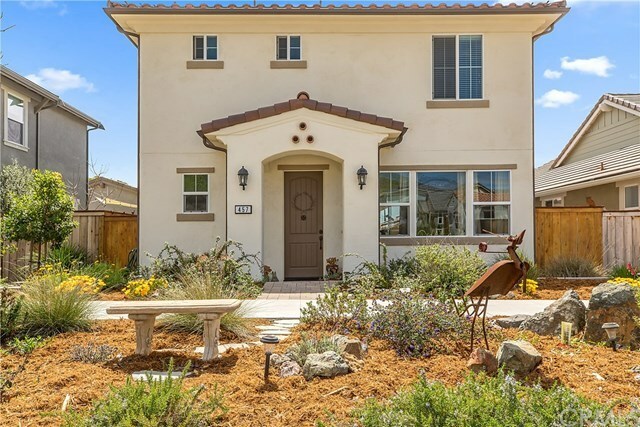 Serra Meadows is a new neighborhood surrounded by lush hills and scenic views with great space if you are so inclined to ride your bikes and/or take an evening stroll. Come on out and experience this charming area.